- a cylindrical piece of stainless steel, whose length is greater than the cross-sectional area. This type of stainless steel differ in diameter, length and wall thickness of the n / f pipe. 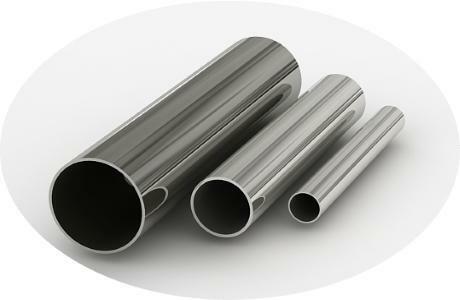 Round stainless pipe, usually made from austenitic hard alloyed grades of chrome-nickel steels, and has properties such as unsurpassed corrosion resistance, providing the possibility of operating the pipe with aggressive media, high strength and ductility, resistance to mechanical shock and vibration, wide operating temperature range sufficiently long service life. Modern stainless steel tubes are produced with a mirror, polished, polished and satin finish outer surface that provides a high aesthetic appearance of this first-class products. Stainless steel pipes of small diameter - is the ideal material for the realization of various design solutions, production of sanitary ware and bathroom accessories. Stainless pipe with a circular cross-section is to electrically and seamless. In the role of sheet metal blanks acts or grade. Today, the production is used several ways of processing the external surfaces of stainless steel round pipes, resulting in expanding choices. There are three main types of surface - matt, brushed or mirror (polished), which are different consumer characteristics and price characteristics. In addition, the metal tube is divided by Performance on general and special purpose tubes. Marking round stainless steel pipe corresponds to the marking of a product is made, ie, the first digit indicates the composition of carbon in hundredths of a percent, followed by the letter symbols of alloying components with numbers indicating the percentage of in tenths. For example, stainless steel grade 08H18H10 tube has in its composition 0.08% carbon, 18% chromium and 10% nickel. BUY stainless steel pipes round! DELIVERY! GREAT PRICE!